Yesterday I spoke to a business coach who had NO IDEA what her genius is. Like most people, she was flummoxed about what she does really, really well — not to mention clueless about how to communicate that so that people get the value of what she does. 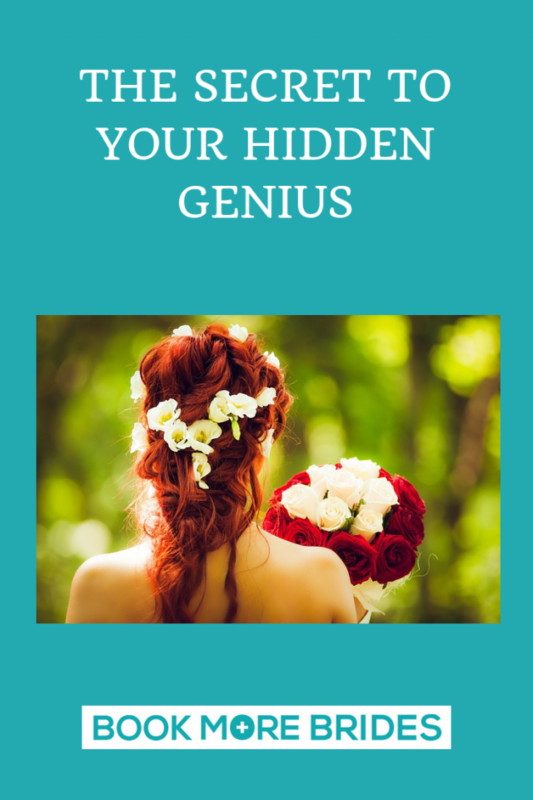 Within an hour long “Genius Conversation,” I’d identified and articulated her unique genius in a way that’s designed to attract her ideal clients. #1 – Your biggest gifts. Your gifts are also the unique ways you look at the world. Hint: your ideal clients will share or be inspired by this worldview, making it critical to connect on this in your marketing. #2 – Your biggest successes. Where have you smashed it in your business or career? Even successes outside the wedding industry contribute to the uniqueness of your genius offering. Brag about these things! It’s what makes you uniquely valuable. #3 – What holds you back. What holds you back and always has? This is likely the same thing that’s holding back your ideal clients, and why you’re uniquely qualified to help them. #4 – The “dark side” of your gifts. With every superpower comes a corresponding weakness. This weakness isn’t a wrongness; it’s actually the secret to your power. It’s also something your ideal clients will share. Your answers to these questions become the genius copy for your website, sales page or ad. Connect on your shared world view. Remind your prospect why s/he needs you by touching on what holds them back and the dark side of their gifts. Position yourself as the expert who understands their worldview AND has the credible successes to back it up. It’s simple — not necessarily easy — because the clues to your uniqueness are right under your nose. That often makes them kind of hard to see. Your challenge: answer these questions and include what you learn on your website.